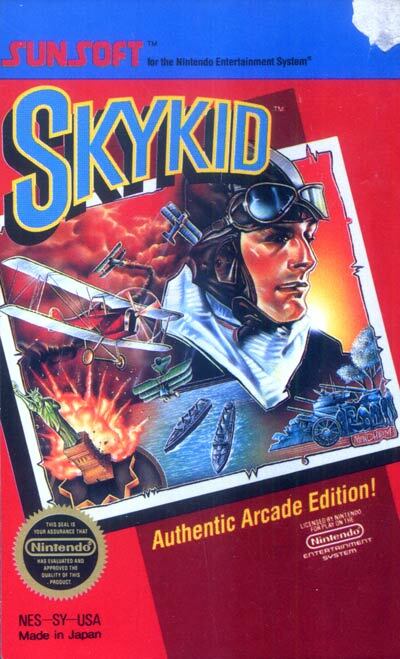 Sky Kid is a two-dimensional, scrolling shooter type of game. The players play as the Sky Kids (called "Red Baron" and "Blue Max" on the flyer.) The Sky Kids fly around in biplanes and are assigned specific targets during the missions. These missions involve bombing specific targets. This would seem easy, however, there are a few obstacles the Sky Kids must overcome to get to the target safely. First, the biplane is not equipped with the bomb. The Sky Kids must pick up the bomb en route to the target. Second, there are both ground and air units that attempt to keep the Sky Kids from accomplishing their mission. Last, the Sky Kids may have to navigate through some very inhospitable terrain or navigate around cities in order to get to the target. The targets that the Sky Kids must bomb will either be a fortress complex or a ship. As one moves farther up in the missions, it isn't uncommon to have multiple targets in one mission. Perhaps barnstorming would have been a better idea.